Hamish MacDonald’s new series The Truth Is? begins on TEN next week, with two stories each week. The second story on Chernobyl is the better of the two on offer in the first episode. Over two million Americans, Australians and other Allied forces have served in Iraq and Afghanistan – that’s a generation who have lived through the horror of war. One in six return home with post-traumatic stress syndrome: they don’t sleep, they can’t hold down jobs and they can’t maintain relationships. This year, for the first time, suicides eclipsed war deaths for Allied troops, and one US veteran commits suicide every 80 minutes. How do you learn to be a killing machine and then return to the quiet, peace and calm of normal life? Hamish Macdonald travels to Arizona, meeting some returning soldiers to find out if they are coping with life back home. 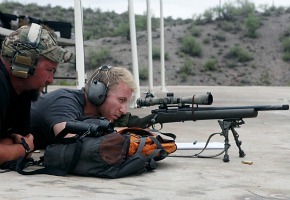 Back home in the US and running a sniper training school, Jesse Johnson is a former ranger sniper who has been on over 300 missions. Immersing himself in Jesse’s world, Hamish learns to shoot, hears about the close bond soldiers form, and takes an unexpected trip to a beauty salon for a pedicure. You may think the Ukraine’s Chernobyl reactor meltdown over 25 years ago, was, and still is a huge threat to human life. But something we live with and take for granted every single day, urban air pollution, is a much bigger threat. Approximately 30,000 people died as a result of the Chernobyl disaster, and while the accident was horrific, what about the damage we accept every day? Globally, 1.2 million people die from urban air pollution every year. Hamish travels to the Ukraine to discover the bizarre world inside a nuclear disaster zone. He tours the plant, meets Chernobyl workers, and goes in search of families who are still living illegally near the old reactor. Just a few kilometres from where explosions blew off the roof off reactor four, locals now hold Sunday picnics, water-ski and even get married. 8:30pm Monday June 3 on TEN. @IheartABC – yep, there’s lots of people who don’t understand that! Line from 10’s press release. “One in six return home.” It should of course be “returns” but can we expect mere writers of press releases to know about verb/noun agreement when most journos do not have a clue about pronunciation, spelling or grammar? Back on topic – can’t see the 10 demo watching this. As for me, Foreign Correspondent does it all so much better. It’s another case of seen it all before somewhere else and done much better. Not unlike the travel spots on The Living Room. It’s been a long time since ten has a go at this type of programming. I hope it works. Just fear it will over expose the talented Hamish given he is the only reporter. Is it meant to be a ‘current affairs’ show or more like a Louis Theroux type show? Hamish is not the first to visit Chernobyl and provide a “lookit me now”. I can’t see him adding anything to the mix except cashing in on where others have trod. I don’t see how Ten can call this a ‘Current Affairs’ show when all of these stories were filmed months ago. I know that is the same for 60 Minutes but they have the ability to show breaking stories also. I can’t speak for Sunday Night as I have never watched it. Is Hamish going to be the only reporter working on this show? As much as I like him I am worried about the show being more about him than the story. I hope I am wrong. I really don’t understand why ten would put this in this timeslot where surely it won’t be able to compete with the Voice and revenge and against 4 corners.